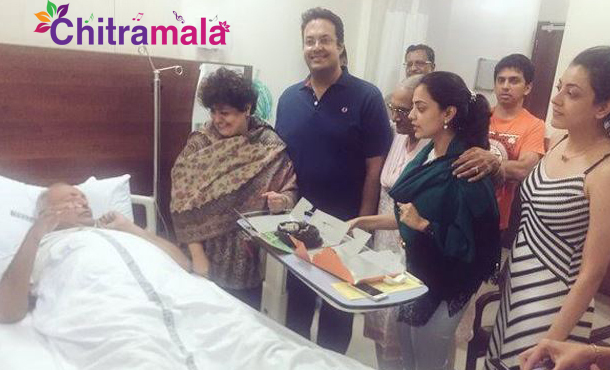 Actress Kajal Aggarwal, who is currently very busy promoting her next film, Brahmotsavam was spotted in a hospital. Kajal & her sister Nisha celebrated the anniversary of their parents in a unique manner. They did it in a hospital. The reason behind this is that the actress’ father was hospitalized and is facing health issues. To make him relieved from pain and other stress, the two daughters united all the family members and celebrated the anniversary at a hospital. Sharing the heart-touching moments, Kajal opined that the real Brahmotsavam lies in entire family members getting united. Happiness is wen d entire family gathers 2gether 4celebrations. Regardless of wer u r.. Brahmotsavam indeed..Happy anniversary mommy and pops! Get well soon pop.” Kajal Aggarwal posted this on Twitter, which revealed that she is very much connected to the concept of Brahmotsavam. The film brahmotsavam is releasing on 20th of May and Kajal plays an Anglo India girl named Kasi.